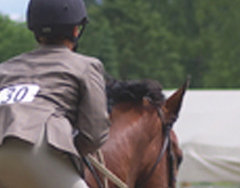 QUESTION: Many Amateurs, Juniors and some trainers talk to their horses during a round. Do you find it offensive? “Whoa,” “easy,” “knock it off!” Whether to soothe, guide or reprimand a horse, the rider’s voice is a useful aid in certain circumstances. Our judges comment on the use of the voice during a horse show performance.